Prague, 1953. Communist leader Klement Gottwald has died leaving behind him chaos, fear and an economy on the brink of ruin. His successors are preparing a monetary reform to save the dying economy but it will result in the greatest rip-off in European history. First they must find a scapegoat for the worsening economic crisis and then the Soviets will orchestrate a trial to divert the nation’s attention away from the monetary reform. Meanwhile, Captain Hakl is assigned to a mundane robbery at a goldsmith’s shop. Hakl, who served during the First Republic and the Nazi occupation, is now a member of the Communist police force. Politics don‘t interest him – he knows that crime is the underbelly of any system. But it is precisely his loyalty and desire for the truth that lead him to understand that this mundane case is more complicated than it seems. Hakl has done his job and now State Security, the Stasi, will take care of the rest. But Haki is too solid a policeman to overlook the discrepancies that have been revealed in this case. Rather than receiving praise for his thoroughness, he is surprised to be reassigned – a specialist in Zionist crime, a Major Zenke from East Germany, is called in to replace him. Hakl begins to suspect the Zenke‘s arrival is no coincidence. When all the evidence suddenly point to the leadership of the Jewish Community,which is accused of ordering the robbery to support the Zionist movement, Hakl begins investigating on his own. A ‘show trial’ ensues when Hakl discovers Zenke‘s Nazi past. • “Powerful! 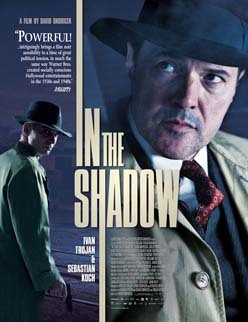 ‘In the Shadow’ intriguingly brings a film noir sensibility to a time of great political tension, in much the same way Warner Bros. created socially conscious Hollywood entertainments in the 1930s and 1940s.” - Eddie Cockrell, Variety. • “A sleek, gorgeously old-fashioned noir that is stylish, yet clean and controlled… recalls the Coen Brother’s masterful ‘Miller’s Crossing.’” – Beth Hanna, Indiewire.